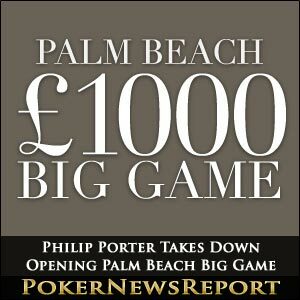 Englishman Philip Porter has started 2012 with a fantastic win from the first Palm Beach Big Game of the year in London. 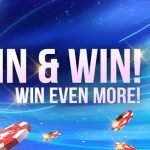 Cambridgeshire’s Porter outlasted 67 other poker players at the Palm Beach Casino in Britain’s capital city to lift the top prize of £13,525 from a prize pool of £68,000 after seeing off fellow Englishman Ariel Adda in their heads-up clash in the £1,000+£80 buy-in No-Limit Hold’em event. 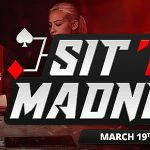 In what was a tough final table, the 39-year-old withstood challenges from the likes of London trio Ian Woodley, Andrew Teng, and Nik Persaud – the 2010 World Heads-Up Poker champion – before beating Adda in their head-to-head encounter. London’s Adda left with £12,345 as runner-up, while Welshman Iwan Jones finished in third place for £12,060. The top five was completed by fourth placed Persuad (£10,955) and Woodley (£9,595). Sixth place went to James Sullivan (£3,400), Teng finished in seventh for £2,720, Dharminder Maker (£2,040) secured eighth place, and Nathan Lee (£1,360) was ninth. Porter’s performance was all the more impressive as he faced stiff competition throughout the tournament from players such as former Team PokerStar Pro John Duthie, Scottish star David Vamplew, experienced London pro James Akenhead, Hounslow’s Praz Bansi – who won last May’s Palm Beach Big Game – and Nottinghamshire’s high-roller expert Sam Trickett, who won the Partouche Poker Tour (PPT) main event in Cannes last September. Additionally, other big-name pros such as Hendon Mob members Joe Beevers and Ross Boatman were unable to halt Porter’s march to glory, while Brighton-based Chris Moorman – who picked up $1,068,690 for winning the World Series of Poker Europe (WSOPE) €10,000 buy-in No-Limit Hold’em main event in Cannes back in October – and James Dempsey, who took down the $10,000 buy-in No-Limit Hold’em Championship Event at December’s Doyle Brunson Five Diamond World Poker Classic Bellagio in Las Vegas for $821,612, could not add to their impressive list of successes with victory in London. The second Palm Beach Big Game kicks off on Monday, February 6, at 19:00 (GMT) with another £1,000+£80 buy-in event at the London venue.